As we mark the midpoint of our current strategic plan, we have seen communities of knowledge and practice continue to grow or begin to emerge in our work in 2016. Some of these communities have come out of the partnerships that PASGR has initiated and nurtured over the years, and they enhance the excellence that has come to be the hallmark of our programmes. Utafiti Sera (Kiswahili for ‘research policy’) is one such community that began to evolve in 2015. It started to bear fruit in 2016. Utafiti Sera is an innovative multi-pronged approach that PASGR is using to help bridge the gap between research and public policy. 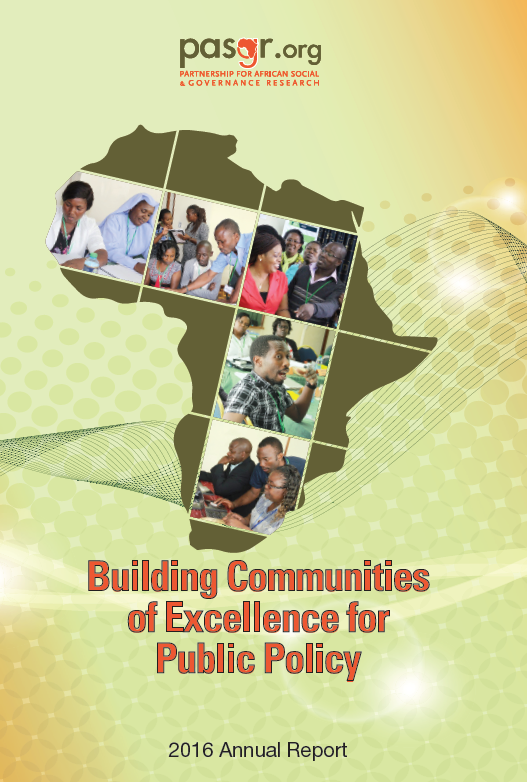 Networks of researchers, policymakers, activists and policy practitioners have now been set up around three PASGR research themes in Kenya and Nigeria. We look forward to applying the Utafiti Sera approach in all our research and policy engagement work going forward. The year under review also saw the first cohort of 22 graduates emerge from the collaborative Master of Research and Public Policy (MRPP) at two universities. This unique graduate programme is designed to produce the next generation of public policy leaders and researchers in Africa. The MRPP continues to gain recognition and ownership on the continent; it is currently offered at 11 African universities, with two more to launch in 2017. We continue to offer our innovative professional development courses in research methods and policy on a cost sharing basis. New modules are in the pipeline. Thanks to a stronger digital and online footprint, we have been able to reach a wider pool of potential participants. Applications have come from as far as India and Pakistan. As always, credit for these achievements is due to the PASGR Board of Directors, Secretariat and our key partners. It is because of them that we now have the communities of excellence that we celebrate in this year’s report.